Kids can beat the winter blues by getting some fresh air while sledding down the exciting snowy hills. Pulling your small child along or teaching them how to sled on their own means spending quality time while they adventure the outdoors. Instead of being cooped up on a snow day, why not to take your little ones outside to enjoy the family-friendly activity of sledding? You’ll obviously need sleds and choosing right sleds is important – both for comfort and safety. Therefore, we thought it makes sense to prepare this practical guide for buying the best sleds for kids possible. It can be difficult to choose from best toddler sleds with so many different types, but our goal is to simplify the research process. If you are looking for the best sleds for kids, we’ve compiled the top choices for every age of toddlers. 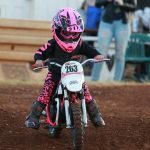 Kids Ride Wild, insightful buying guide will bring you to the perfect fit for your child. Sleds come in many different types including plastic, steel, foam, snow tube and wooden sleds. Instead of making you search through hundreds of models online, we’ve collected all of the best snow sleds for kids. We’ve split them up based on options for 2 year olds, 3 year olds and 4 year olds. Take note of the features of each sled and use our buyers guide to narrow down the choices for your little one to enjoy the exhilarating ride. We’ve also outlined a few sled riding tips to make it a safe experience for kids! Tow your little one through the snow with the Paricon Toddler Boggan Sleds. This sled attracts toddlers with the simple, bright red design that is recommended for ages 18 months to four years old. Despite the simplicity, this model will be a blast for kids to enjoy the winter season. Parents simply use the attached rope to pull their child along down gentle slopes. The rope is not very long making it safer to keep parents close to their little rider. This sled will be a great introduction to sledding, giving your child a chance to feel the motion of sledding while having the security of a parent holding on to the tow line. To keep toddlers safe and secure, it has a high back seat with an added safety strap to secure the rider. If you want something that is easy to carry around while holding your toddler in one arm, the Paricon Boggan Sled is a great solution. The sled measures 12.3 x 16.5 x 26 inches and weighs less than 3 pounds. Your baby’s feet will comfortably fit inside the sled so you won’t have to worry about them dragging through the snow. Made from a durable plastic material, it is manufactured to withstand long hours of sledding outdoors. The contoured bottom ensures a smooth ride down the incline without catching too much speed. This is surely one of the best toboggan sled choices that is both safe and loaded with excitement. >> Check out Paricon Toddler Boggan Sleds on Amazon right here. The EMSCO Group Toddler Sled is ergonomically designed to keep kids comfortable while playing outdoors. No longer will your toddler be excluded from sledding with the big kids as this model is great for smaller children between 18 months and 3 years of age. Sled provides superior durability and stability while in motion. The base is extra wide to help keep your little one in an upright position at all time. Pull your child up and down small hills with the attached heavy-duty tow rope. It performs well even in thick snow as the bottom has tracking rails to travel in a straight direction. Kids will love the cushioned padding that supports their back as they cruise through the snow. This sled measures 10 x 20 x 27 inches and weighs only 3.3 pounds. Not only is it lightweight, but it is made by a trusted brand in the U.S.A. Your little rider will enjoy the adventure while you tow them along sitting in the ergonomic seat. They will stay seated without falling out as the seatbelt strap locks in place. To sum up, this is undoubtedly a sturdy and high quality sled for your child to experience the outdoors safely. >> Check out EMSCO Group Toddler Sled on Amazon right here. If you are looking for the best wooden sled for toddlers, the Pelican Baby Sleigh is an excellent choice. The seat is well elevated to keep your child inches above the snow. The elevation will your child dry and prevent them from dragging their feet while in motion. This sled measures at 14.5 x 11.25 x 30 inches which will give your small child plenty of room to stretch out their legs. This sled is built primarily from wooden partitions with the runners reinforced with HDPE polymer. It also has a double-slat backrest to support your child’s back while in motion. Weighing at 6.7 pounds, it is easy for parents to pull their little rider along through the snow. There is no maintenance involved with this baby sleigh which assures you that the baby sleigh will last for years. You can even hold onto it as a family heirloom to hand down to your child’s future children. When compared with plastic sleds, this sleigh is much more durable and long lasting. It comes fully assembled for kids to be able to hop on and enjoy the ride as soon as the snow falls. You can even fit 2 toddlers inside while you are pulling the sled along. The classic design will remind you of the sleighs that you rode as a child. This sled will keep your small child or baby entertained for hours of sledding as there is no better thrill than riding along the snow slopes. >> Check out Pelican Baby Sleigh on Amazon right here. Aqua Leisure’s Inflatable Toddler Sled is an adorable way for your child to ride through the snow. This sled is ideal for kids ages 1 to 3 years and features an attractive design for both boys and girls. With a kiddie snow seal character, this white and blue sled will be full of excitement for toddlers to ride through the snow. Parents will have the added security of being able to tow their little one along with the heavy duty pull rope. 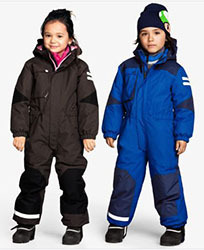 Simply inflate the sled and your child will be ready to cruise down the slopes. The inflatable design makes this an extremely portable solution to travel with you to any outdoor slopes. When fully inflated, this model measures at 10 x 5.8 x 3.5 inches which is the perfect size for one toddler to ride down the hills. It weighs a mere 1.9 pounds making it easy to grab when you are ready to go. This colorful snow tube will be the most popular sled in the neighborhood as it is truly one of a kind. This toddler sled is more than just aesthetically attractive, it provides enhanced cushioning for kids to be comfortable while cruising through the air. The bottom of the sled is well crafted to slide with a sleek surface for smooth cruising. Kids simply hold onto the edges of the sled and experience the wind blowing through their hair. Your child will be begging to go outside on the next snow day to slide down the slopes. >> Check out Inflatable Toddler Sled on Amazon right here. Among the best sleds for 3 year old children, the Flexible Flyer Wooden Baby Sleigh features the classic sleigh that many parents remember from their childhood. This toddler sled is handcrafted from a beautiful ash wood material that is sure to last for many years to come. You can be assured that this model is unique from the common plastic options that many kids have, as it is a beautifully constructed traditional sled. Measuring at 11.5 x 15 x 29 inches, this sled is perfect for children ages one to four years old. It has a pull rope attached for you to keep your rider safe at all times. It is super easy for parents to pull weighing at only 3 pounds and you won’t have to worry about the rope fraying or breaking as it is extremely durable. Kids will sit back and relax with their back supported by the steam bent backrest as they cruise down the slopes. The runners keep the seat of the sled above the snow, so little ones won’t get their clothes soaked in wet snow. Additionally, there is a protective bar that will keep the base of the sled nice and secure as it slides through the snow. You are able to keep your child close by and the protective bar works to prevent injuries by keeping your child inside the sled. This is a sturdy solution made of high quality wooden panels for your toddler to enjoy the winter season with style and excitement. >> Check out Flexible Flyer Wooden Baby Sleigh on Amazon right here. The Lucky Bums Plastic Racer Sled will be an excellent addition to your child’s toy ensemble for many trips down the baby slopes. Children ages 6 and under are recommended for this sled as it has a 100 pound weigh capacity. This model measures 10 x 20 x 40 inches and fits well for 3 year olds in particular because it will introduce them to the joys of sledding in a safe and controlled manner. One feature that sets this sled apart from other models is the steering wheel, kids can use the wheel to carve turns as it is connected to a wide track ski paddle in the center. Little riders also have the ability to slow down if the slopes are too steep with the built-in handbrakes. This will add to parents peace of mind that their toddler is able to control the speed of the sled. You can use the sled to cart around winter gear as you and your kids climb up the hill with the attached pull rope. The pull rope can also be used to tow your child along as they get more confident with their sled. For the rider’s safety, all of the edges of the racer sled are smooth unlike with some of the wooden sleds that have sharp, square edges. There is no need for thick gloves as the rounded edges won’t scrape or cut your child’s hands. For added stability and comfort, it has built in foot holds to rest their small feet. This model comes in four different color scheme options including blue and yellow, pink and black, red and yellow and green and black. The Lucky Bums Sled is surely the best plastic sled for 3 year old children with it’s neat design and added features. >> Check out Lucky Bums Plastic Racer Sled on Amazon right here. 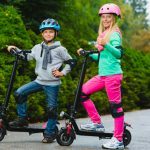 If you are in search of a lightweight sled for your child, the Zipfy Two Tone Series and Freestyle Luge Snow Sled will provide an exhilarating ride. Whether they are riding down a freshly packed ski slope or hills in the neighborhood, kids will be incredibly safe as they zoom downhill. This uniquely designed sled is engineered for virtually any age with a 250 pounds weigh capacity but it is ideal for 3 year olds because of how easy it is to steer. Small children can maneuver the sled from side to side simply by leaning in the direction they want to head. When your little one is ready to stop at the base of the hill, all they have to go is place their heels in the snow. It has a lower center of gravity than most plastic sleds making it simple to stop. Kids love the extra splash of color on this plastic snow sled with a two shaded design. It comes in five different color options including blue on blue, firefly red, green on green, jambob edition and purple on pink. Measuring at 20.5 x 12.75 x 13.5 inches, this is a compact option for your child’s excitement while being easy to carry. It is made from high quality polyethylene plastic that makes it a rugged choice for outdoor exploration. Even when the sun comes out, it will withstand the sun rays as the material is UV stabilized. Your child will adore the added flavor in the design with racing decals and a colored seat pad. >> Check out Zipfy Two Tone Series and Freestyle Luge Snow Sled on Amazon right here. The Slippery Racer Downhill Thunder Winter Toboggan Snow Sled offers a new twist on the classic plastic sled. The bright blue design is attractive for both kids and parents This sleek sled features Slippery Racer’s IceVex cold resistant treatment to keep your little one warmer while they are zooming down the freezing slopes. You won’t find any other sled brands that include this exclusive technology. Not only is this model ahead of the game when it comes to functionality, but it gives toddlers more control over their speed. With a built-in braking system, kids simply tug on the brake handles to slow down. Three year olds will have plenty of space to stretch out their legs as this sled measures at 30 x 15 x 5.25 inches. There are even molded foot holders to keep their feet in place while sledding down the snow slopes. This toboggan snow sled is manufactured from a heavy duty plastic material that has a slick coating to protect the finish. Compared with other plastic sleds, it will last much longer because of the strength and quality of the construction. Toddlers will feel safe as they are holding onto the reinforced handles and zooming through the air. Weighing at only 2.15 pounds, this sled is extremely portable so you bring it along for many snow trips. Winter time will come to life when your little one is sliding down the hills on the Slippery Racer sled. >> Check out Slippery Racer Downhill Thunder Winter Toboggan Snow Sled on Amazon right here. For a unique snow sledding experience, the Flexible Flyer Steel Saucer will be full of fun for your child. Great for ages 4 and up, this steel saucer sled will slide down the slopes much faster than a plastic or wooden sled. Kids can embrace the ride while staying in place by holding onto the two rope handles on the short edges of the sled. Whether they are going down a short hill for a quick ride or sliding down the long mountain slopes, this saucer is full of thrills for kids. It has an oblong oval shape that measures in 26 inches in diameter and 4 inches tall. Weighing at only 7.1 pounds, the Flexible Flyer Saucer is easy to carry up the slopes. Simply grab one of the straps and it will come alongside you with ease. Young riders are attracted to the dark red design that will stand out from many of the other sleds on the hill. The surface is also powder coated to make it last longer when compared with other steel sleds. In addition to it’s attractive design, this model is made in the USA which offers assurance that it is a quality product. If you want to buy your child a toy that will last for years, this sled is a superb choice with it’s steel construction. For kids who want a striking design, they can slide down the snow sloes in a hurry with the Flexible Flyer Saucer. >> Check out Flexible Flyer Steel Saucer on Amazon right here. If you want the best foam sled for your child, the Flexible Flyer Aurora features a unique design packed with speed. The manufacturers of the classic Flexible Flyer sled put together a modern rendition with flashy blue, green, yellow and grey striped graphics on both sides. This sled has a sleek surface for little riders who love fast paced action as they are sliding down the snow slopes. Recommended for children ages 4 and up, this foam sled will keep young children safe as they are moving downhill. The two handles are extremely sturdy and will stay in place as you carry around the sled for your child. This is a great option if you desire a lightweight solution to bring along for every outdoor adventure. It weighs less than 3 pounds making it effortless to carry around when your small child is finished sledding for the day. Measuring at 36 x 20.5 x 2 inches, kids have lots of room to stretch out their legs while cascading through the wind. Even 2 kids could ride at the same time on this sled. It is a stiff foam board that won’t bend or break if it is thrown down the slopes. 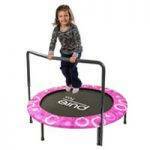 Durability and size make this great for 4 year old children to use for many years of their childhood. For an eye-catching ride through the snow, kids will be excited to zoom down the hills. >> Check out Flexible Flyer Aurora on Amazon right here. The Slippery Racer Grande XL Inflatable Snow Tube Sled is a commercial grade sled that provides a smooth riding experience for your child. It comes in 7 different color options including black, blue, camo, green, pink, purple and red. You can choose one that aligns with your child’s favorite color! The heavy duty inflatable tube features a hard shell polyethylene material that will absorb any impact that your little one may encounter. Not only does it feature a durable material around the shell, but the sled is coated with the Ice Vex treatment to keep it warm while traveling through the freezing snow. 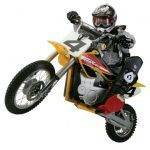 This model accommodate 4 year old children and up making it ideal for any one in the family to ride. To tow your little one along or even lug around snow gear, this snow tube features a double reinforced pulley tow rope. The rope has extreme strength along with over 4300 pounds of tensile strength. For kids to hold on while in motion, the sides also have nylon webbed grip handles that provide safety for their ride. This sled has a 36 inch diameter with a 6 inch thickness and weighs 18 pounds when fully inflated. The Slippery Racer Grande is a popular choice for the entire family and in our opinion, it’s one of the best snow sleds for 4 year old to enjoy many fun-filled snow days! >> Check out Slippery Racer Grande XL Inflatable Snow Tube Sled on Amazon right here. When purchasing a sled, it is important to take note of what type you think will be best for your little one. The various types of sleds include wooden, plastic, steel saucer, inflatable and foam. Wooden sleds are the most durable because the construction is built to last for generations. If you are looking for more speed for your toddler to zoom through the snow, steel saucers have a slick bottom for sliding down the slopes. Plastic sleds often have the functionality of kids being able to steer the direction that they are traveling. For kids who value comfort, inflatable and foam sleds have the most cushioning for their ride. When looking at sled options, take note of the age recommendation to ensure that it will provide a safe environment for sledding. Some models are designed for specific ages ranges such as 18 months to 4 years while others just have a minimum or maximum age recommendation. If you want the sled to last for several years, make sure that it will accommodate your child’s current age with more room to spare. Most sled models have a maximum weight capacity that defines the amount of weight that they can safely hold. Since children grow very fast, make sure there is at least a 20 pound cushion between your child’s current weight and the maximum. While you can take a trip to a recreational store, there are many options available online to choose from. Buying a sled from Amazon is the most advantageous because of the Prime shipping options and massive selection. Other online retailers such as Walmart or Target may have several sled options to choose from but far less than Amazon. 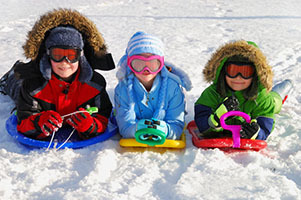 Once you’ve selected the best sled for your child, it is important to follow the proper sport and safety guidelines. Here are some helpful tips on sled riding for kids. Before sledding through the snow, it is important that kids are wearing the proper attire and protective gear. The winter season can be extremely cold, making it vital for kids to wear warm clothing so they don’t get sick or expose their skin to the freezing snow. It is recommended for kids to also wear gloves that have a good grip to hold onto the sled and keep their hands warm. Especially for younger children and toddlers, a helmet is also necessary to ensure their head is covered in the case of a fall. Make sure to find a helmet that fits securely and that your child always puts it on before going down the slopes. 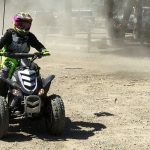 Wearing protective head gear should be mandatory as you never know if there will be a bump or obstacle that will send your little one flying off the sled. It is always better to have the added peace of mind than to worry about your small child getting a head injury. Toddlers should start on small incline hills as they are safer when parent is pulling the tow rope. 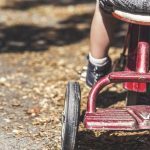 As your children get older, you can start finding larger hills with slight more incline so they can speed down with their friends. It is not recommended to choose a steep hill for small children because they need a chance to get comfortable with sledding before they go zooming down the fast slopes. Use your best judgement when selecting a sledding hill as you want it to be a fun experience for your child without presenting too much risk for injury. Your top priority should always be the safety of your little ones. Be sure to teach them to hold onto the sled handles or edges at all times while in motion. Another obvious rule is to not allow them to go down head first. Their feet should be kept on the sled to avoid dragging them through the snow while going down the snow. If the sled has hand brakes or a braking mechanism, be sure to teach your child how to use them to slow down. Finally, make sure to show your kids how to come to a complete stop by planting their feet firmly in the ground. Now that you’ve reviewed the best toddler sleds, we hope that our buying guide has helped you to conclude on a sled that will be a blast for your child to hop aboard and experience the snow slopes. Whether you are pulling your winter baby along the snowy paths or teaching them how to speed down the slopes, it will surely be an experience full of laughter and excitement!